Since 2010, the Djynamo project has brought together young people from all over Europe who are engaged in work to overcome extreme poverty and social exclusion. As part of the Stop Poverty Campaign, Djynamo worked closely with ATD Fourth World’s regional team in the Netherlands to organise a gathering in Wijhe this past August. A total of 150 young people took part in the event which included fun, intellectual, artistic and sporting activities. The aim of the gathering was to raise awareness about poverty throughout the world, but particularly in Europe where the issue does not get as much attention. The gathering began with welcome activities for the delegations from Poland, Ireland, France, Germany, Luxembourg and Belgium who spent the first day getting to know one another. Activities included ultimate frisbee and some lesser known Gaelic games. Over the next three days, the participants could take part in 26 workshops. Some of these involved sports, outdoor games and art, while others focused on communication, theatre or debates. Workshops included: Looking Ahead, Language Crossing, Including Everyone, The Youth Guarantee, Debates and Perspectives, and Forum Theatre. The “Looking Ahead” workshop examined ways young people view their future by asking participants to fill in sentences such as “I want my future to contain…” or “I don’t want my future to contain…”. This activity helped the young people develop focus and determination with regards to shaping their own future. In the “Language Crossing” workshop, the young people from diverse cultures learned some basic sentences in foreign languages as an exercise in opening up to others and learning about new people. Participants learned how to introduce themselves and say where they came from. This workshop got participants talking about what it means to include everyone through a discussion about the 17 Sustainable Development Goals (SDGs) for the United Nations Agenda 2030. They were especially interested in the SDG’s goal of leaving no one behind. One young person said that, “from the moment we are born we are all humans, and wanting to dwell on our differences is tantamount to excluding someone.” Participants agreed that “including everyone” should be a common goal for all people and institutions. They left enthusiastic about continuing to work together on issues related to the SDGs. 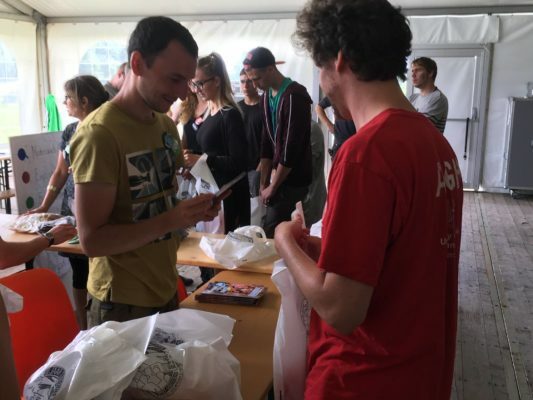 The European Union Youth Guarantee was created to help young people in difficulty, yet many of the young people at the gathering did not know anything about it. Unfortunately, some countries do not take advantage of what could be a vital programme for young people of all origins. In this workshop participants discussed their job experiences and proposed solutions for problems young people face when entering the workforce. Some described obstacles they encountered trying to get a job. Others talked about how they found a job and difficulties in their employment experiences, especially issues dealing with other people in the workplace. Hearing how some had overcome obstacles inspired those who still face challenges finding work. Some, but not all, countries require a degree for employment. It can be impossible to find work without the financial means to pay for the required education. One of the solutions discussed at length was the idea of a universal income which has been discussed in a number of European countries recently. The gathering ended with participants presenting what they had learned and sharing other thoughts. Organisers thanked the interpreters, facilitators, catering teams and everyone else who helped make the event such a success. Participants left feeling empowered to keep working to overcome poverty and change things for the better. They look forward to meeting next year. Meanwhile, they urge everyone to make their voices heard through the ATD STOP Poverty campaign’s Call to Action. 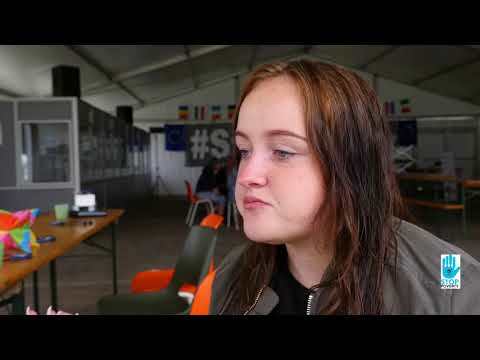 In this video, young people involved with ATD discuss learning about International and European policies designed to support young people and alleviate poverty.